Last time, we talked about two ways to really help your self-editing: reading aloud and reading backwards. Now we’re going to look at two you might not have considered before. This tip deals with the idea that it’s easier to edit something you’ve read before if you can make it look different. So another way to get your brain to take a fresh look at what you’ve written is to print it out and read it on actual paper. These days, most of us do our writing on the computer; we type and the words appear on the screen. By printing out your document and reading it with a pen in hand, you may notice problems, errors, and quirks that you didn’t see on the screen. And mix it up if you like. Make the font really tiny or all fancy. Change the line breaks with bigger margins. Just don’t mess up the look so much you can’t concentrate. A related tip is to write it out longhand first, and then transfer your work to the computer. Writing things out by hand takes longer (unless you seriously can’t type), which allows you to think differently about what you’re writing and how you’re writing it. When you type up your paper, you’re able to edit the work almost as if someone else had written it, letting you more easily accomplish a self-editing pass. Common typos like “teh,” “liek,” and “adn,” or words you know you tend to misspell. Extra spaces—just type two blank spaces into the Find box and a single space into the Replace With box to replace all double spaces with single ones. Words that you tend to overuse. If you’ve ever been told that you use “actually” or “really” too much in your writing, search and destroy it in Word. Making sure you capitalize or don’t capitalize a certain word consistently. A word of caution. 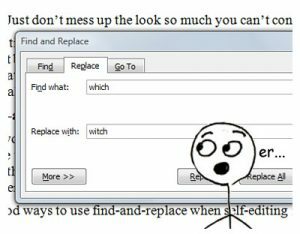 Be sure you don’t “replace all” unless you’ve checked that your “find” command is specific enough not to include things you don’t want changed. For example, say you realize you’ve spelled it “compliment” a few times when you meant to write “complement.” To make it easy, you tell the “find” function to look for “pli” and replace it with “ple.” Hitting “replace all” is going to make for quite the mess. These are just a few of the ways that professional writers and editors review their own work. What are your strategies to help you self-edit?